In a highly anticipated rematch from round 1, the Toronto Dingos faced off against the Ottawa Swans on Saturday on their home deck at Humber South. After a tough loss to open the season in Ottawa, the Dingos were looking for a strong performance against the league’s top side. Despite the anticipation, the match was looking ominous for the Dingos even before it started. A combination of summer holidays and weddings meant that the home side had over 20 outs for the week and went into the match with only 14 available players. The Swans respectfully matched the Dingos at 14 a side to make it a more level match, but the numerous outs would prove costly. The first quarter saw the Swans take a strangle hold on the game from the very beginning. Tom Bell fought valiantly in the ruck while the full back line of Tim Indian and Gary ‘Gazza’ Conlon did their best to repel the Ottawa attack. However, the Dingos emerged from the first quarter scoreless, down by 6 goals. In the second term, the Dingos found their legs, pushed on by Stef Cosma who asserted himself at centre-half forward. Cosma moved up and down the ground taking strong grabs and helped get the ball to the full-forward line of Rob McNaughton and Paul Tinkler. The third term was the best quarter of the day for the Dingos. Midfielders Michael Ladd and Mike Bocian ran all day and continued to fight in the guts with little chance for a rest. Denis Cormier and Lynden Evers were switched into defence and played exceptionally well in their new positions creating goals from the backline. Dan Gunn and Ben Moller were equally imposing across the half-back line. 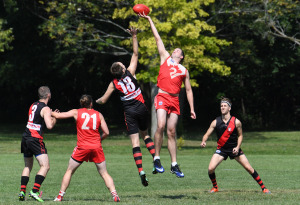 Despite the strong ‘premiership quarter’, the Dingos could not continue the momentum into the fourth quarter. The summer heat, lack of substitutions and highly skilled Ottawa side all eventually took their toll and the Swans ran away with a big win. It was a strong effort by an undermanned Dingos side against one of the league’s premiership favourites. BOG went to Stef Cosma for his hard work at CHF and on the ball as well. The Dingos look to bounce back on Saturday against the Central Blues.